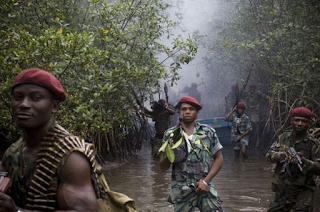 Unrelenting members of the Niger Delta Avengers (NDA) took their destruction of oil installations to Bayelsa and Rivers States in the early hours of Friday as they blasted Nember 1, 2, 3, and Tebedaba brass trunline line. Security sources said that the militants attacked the trunk line in two speed boats with 500 horsepower engines that facilitated their escape. He said the militants had easy access to the facilities following the scaling down of military presence in the region in line with President Muhammadu Buhari’s directive. “Those hoodlums stormed the Nember 1,2,3 and Tebidaba trunkline in two speed boats powered with 500 horsepower engines. This facilitated their speedy escape from the scene. There is nothing the military can do about it because they have been ordered to scale down their presence in the creeks”, the security source said. The Niger Delta Avengers has already claimed responsibility for that attack in its website signed by its spokesperson, Mudoch Agbinibo. “At about the (hour) of 3am to 5am the Niger Delta Avengers blowup Nembe 1, 2, 3 and Tebedaba brass trunk-line in Bayelsa/River States”, it claimed in the statements title “NDA Hit Again”. The group again warned the public to be wary of impostors on Facebook account noting it was no longer on social network. “We still using this medium to warn the general public of impostors Facebook accounts. 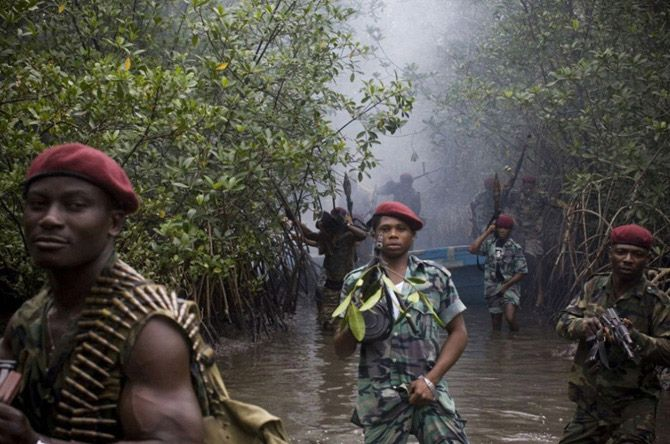 Niger Delta Avenger is not in Social network anymore”, it added. The militant group had on Wednesday night blasted another Chevron manifolds at a creek in Warri North Local Government area of Delta State. The group, which made the attack known on its website late Wednesday, said it blew up RMP 22, 23 and 24 all in Warri. Meanwhile, ex-Chairman of the Delta Waterways Security Committee (DSWC), Chief Ayiri Emami has said that the Niger Delta Avengers (NDA) wants to frustrated Chevron Nigeria Limited, (CNL) out of operations in the Niger Delta region with its consistent and deliberate attacks on its facilities. Emami, who spoke to Journalists on phone, called on the Federal Government to rise up to its responsibility and protect the oil multinational. “Avengers should be quickly checked by government before they accomplish the plan to stop Chevron operations in the Niger Delta region. The militant group is sending a very wrong signal with its unprovoked and unchecked on Chevron’s facilities. “The federal government should not sit down watching. It is government’s duty to protect life and property and the property of Chevron is daily at risk,” he said.